In 1974, production began at the Speke No.2 plant in Merseyside for a whole new sports car – the Triumph TR7. 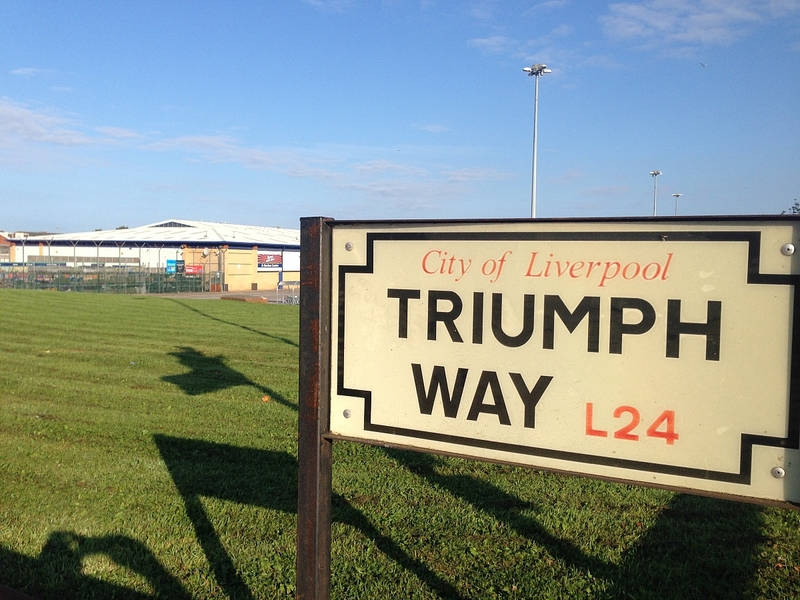 Fast forward 40 years exactly to a cold but clear autumn morning and Triumph Way at Speke resonates to the sound of wedge shaped TR's once again. The date is 21st September 2014 and to commemorate the forty years ago since production began, 40 TR7s of all the various types and configurations had gathered outside the location of that old factory, now a series of industrial units and an Asda supermarket. Even to a casual passer by, the sight was awesome. 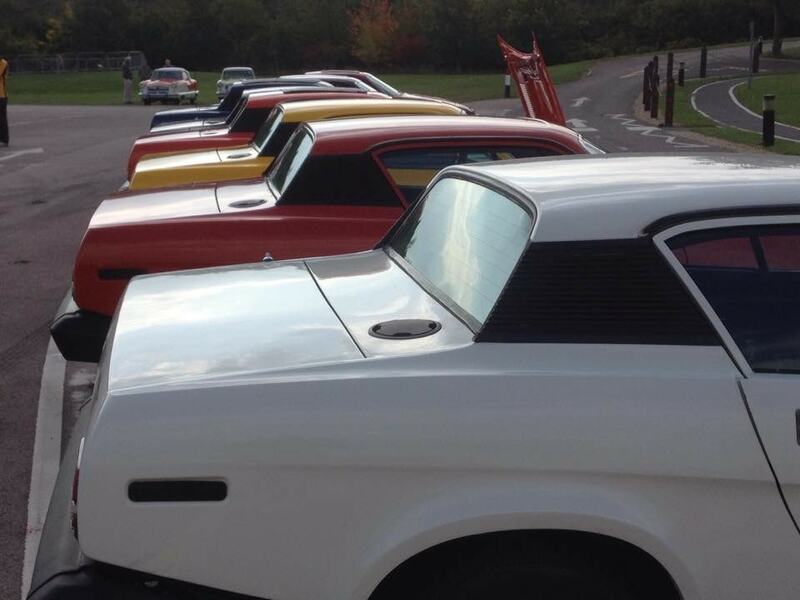 The cars were arranged for photographs four abreast and ten deep. This created an appearance not unlike the archive photographs of the dispatch yards from when the factory was in full production! Also in attendance at the start of the convoy was Gordon Birtwhistle, test driver of many pre-production TR7s. The day before, he had hosted a select group of owners at MIRA and put an early 4 speed white fixed-head coupe through its paces on the dry handling circuit. The car belonging to Paul Lewis was reported to have made a good account of itself driven flat out as it would have been in those development stages of the period. There are of course no photographs allowed at this top-secret facility. With commemorative plaques supplied by specialists Robsport International in hand, the TR7 drivers headed off on an advised route that would see them visit two further factory sites involved in TR7 production, Canley and Solihull. The first section of the route took a winding selection of country roads into Shropshire avoiding the motorways and providing an absolutely delightful run through picturesque villages. A halfway stop at a packed bikers café provided an opportunity for welcome refreshment, bacon rolls and hot teas all round before the convoy of 40 TR7s once again departed for the remaining two factories. It really was a momentous, once in a lifetime sight seeing so many wedge-shaped TRs travelling together in convoy. A radical departure from the outgoing TR6 the controversy around the TR7's modern shape is well documented. But, seeing these cars out on the road in such numbers is a testament to the passionate regard TR7 fans like us at the TR Register still hold for the car. You get to appreciate just how ahead of time the car actually was and the onset of time has softened the initial shock around the wedge design which looks fresh and current even in 2014. Enthusiasts have in the main solved mechanical issues over the years and at relatively affordable prices to buy and run, the Triumph TR7 is now a very attractive proposition, especially in V8 form. The Speke factory closed down after endless industrial action on May 1978 and production moved to Canley wherethequality of the cars vastly improved. 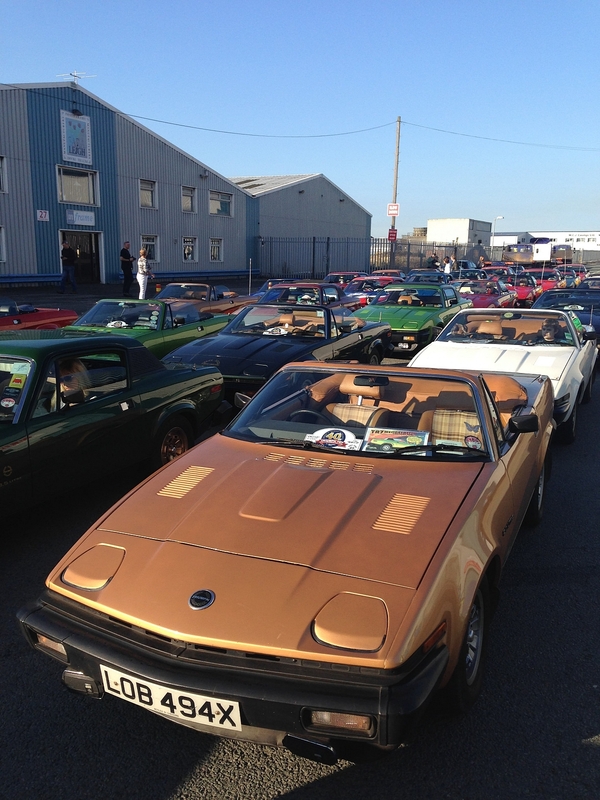 This was the next stop on the convoy run for the 40 lucky TR7s to be making this uniquemoment of history. On the site of the Canley factory stands of course the Standard Triumph Monument on Herald Avenue. It was during the Canley era that the convertible TR7 was finally released after much panic development work behind the scenes before production moved to its final location at Solihull, where these days nothing of the original site remains. Despite limited access this provided another stop before the convoy headed to it's final destination of the Heritage Motor Centre Museum at Gaydon. 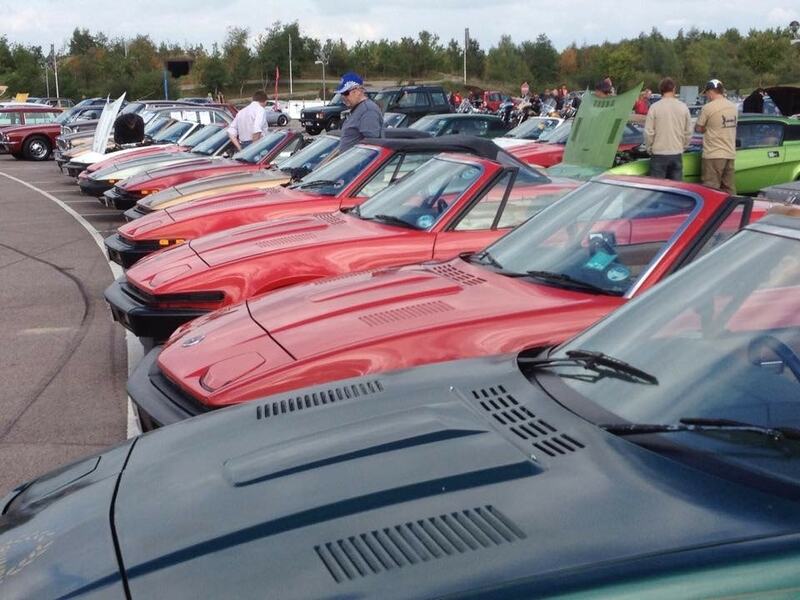 Although the convoy run had been limited to just 40 cars the final stage of the day of celebration saw 107 TR7's gathered outside the Heritage Motor Centre Museum. These included everything from rolling restorations to pristine concours-worthy wedges, convertibles, fixed head coupes, 4 and 5 speed manuals and automatics. There were a large number of factory standard cars alongside big V8s, track cars and Grinnall conversions as well. At 3pm the day was rounded off with a cake cutting ceremony and speeches from TR7 designer Harris Mann and Tony Lee, Chief Development Engineer who amidst an hour of amusing banter offered some unique insights into the politics, challenges and successes of the TR7 project. The TR Register and TSSC supported the TR Drivers Club fully in the event but none of it could have happened without the hardwork of John Clancy and team to whom thanks from all the TR Register wedge pilots goes for organising such a memorable occasion. January 2015 marks the 40th anniversary of the TR7 going on sale in the US and although it wasn't until May 1976 when it appeared in the UK we will be looking forward to a year of celebrations in 2015 to mark the fortieth anniversary of the last of the great TR range of sports cars.